They’ve been down this road before, Subaru has. Fresh into the 21st century, Subaru saw that the crossover trend wouldn’t stop with the mid-size wagons like the Outback and compact SUVs like the Forester, and they wisely decided to branch out with a larger mid-sizer that could seat up to seven, but with all the usual Subaru ingredients like a boxer engine, symmetrical all-wheel drive, and a low centre of gravity for superb handling at the head of the class. Those tempted across the aisle by Subaru’s safety and rugged image will have good reason to take the chance on the newest seven-seater on the market. Subaru also decided to go with quirky, distinctive styling to stand out from the crowd, and boy, did that strategy fail spectacularly for the brand, whose previous designs were at best boring and anonymous (with the occasional monster wing thrown in for the STI). Though its limited interior space did it no favours, the Subaru B9 Tribeca fell flat on its face largely because of that disastrous schnozz. While it lingered on the market for almost a decade, it was an afterthought in a segment that was booming. Despite its demise, there was no question that a seven-seat SUV would still be a welcome addition to the Subaru lineup, even more so now, if executed properly. 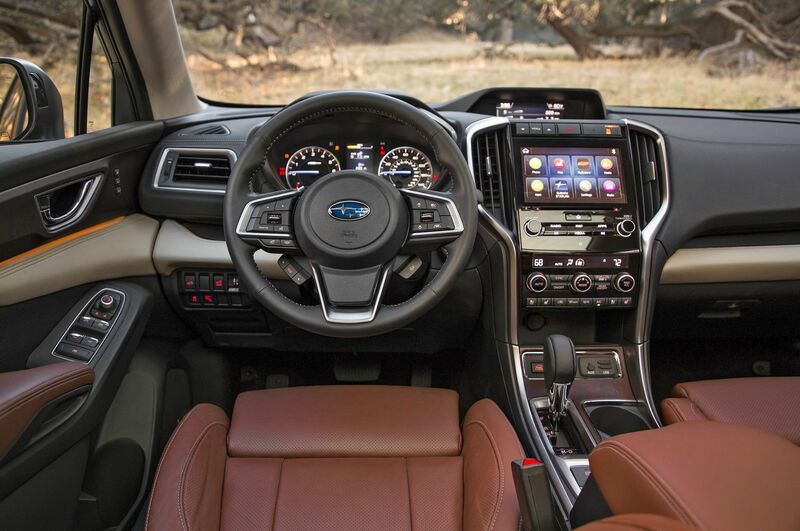 The 2019 Subaru Ascent is exactly that, and exactly the right way for Subaru to re-enter the three-row SUV market. Don’t get me wrong, it’s not perfect, but it is just right. While it is large, don’t get it confused with full-size SUVs like the Chevy Suburban or Ford Expedition, as those are officially classified as “humongous”, and the Ascent competes with other large “mid-size” seven-seaters like the Honda Pilot, Ford Explorer, Nissan Pathfinder, etc. However, calling it mid-size just doesn’t do it justice, as it is properly large, the largest Subaru ever, dwarfing the diminutive Tribeca and even offering up decent space in the trunk with all three rows in place. The Ascent’s 498 L space is generous enough to fit a couple hockey bags, bulky stroller, or a week’s shopping even for a large family. To load up all of those things at the same time, though, you’d need to drop at least one side of the 60/40-split third row, which is an easy task as they drop effortlessly at a tug of the release strap and aren’t much harder to raise by pulling back on the longer straps that are kept in reach and tidy with Velcro. However, just one side of that third row would not have been enough for us as the freshly arrived 2019 Ascent was our annual camping trip chariot, responsible for carrying our family of four and all our assorted camping paraphernalia from the outskirts of the GTA to Algonquin Provincial Park, a round trip of roughly 600 km. With two kids and a stack of pillows ensconced in the second row, we used up every bit of cargo space behind the second row right up to the window line and beyond. Officially rated at 1,331 L, no matter how big it is, it always feels like an entire house’s worth of junk when you’re trying to Tetris that last bag or pool noodle in without obstructing the rear view entirely. If you ditch the kids with grandparents, that cargo bay increases to 2,435 L with the second row stowed, and at over two metres long and perfectly flat, all but the tallest campers could lay out and sleep in the back. 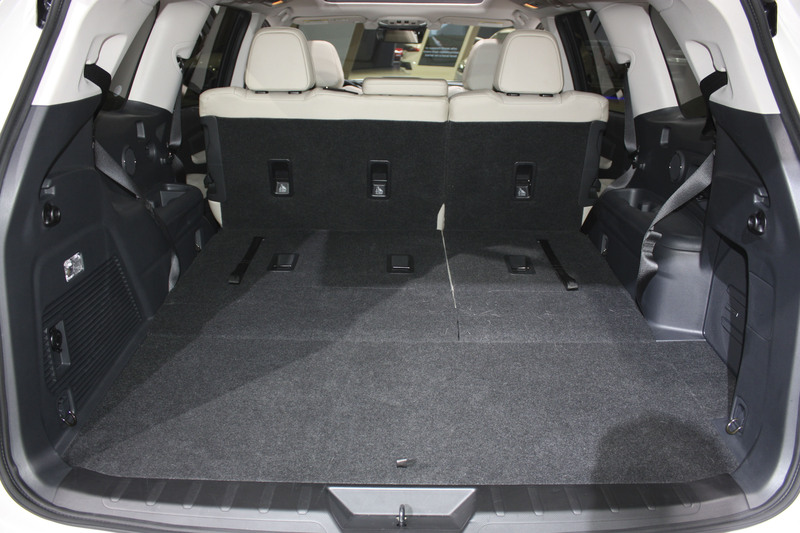 Aside from the sheer volume, there is also a hidden compartment under the rearmost floor panel for a few small odds and ends, and a special slot for the cargo cover when it needs to be stored – note that the cargo cover can only be used with the third row stowed as its attachment slots are just behind the second-row seatbacks. While the Ascent is well designed for cargo, humans aren’t overlooked in the least, right back to the third row. The third row’s still more of an occasional-use quarters for adults, but there is enough headroom and legroom to not feel excessively cramped, even for my 5’10” frame. The likely passengers back there, kids, will have no trouble with the space, and are even treated to their own cupholders and speakers on each side, and USB charging ports on the passenger side. Although the second-row seats don’t flip and tilt – allowing you to have a car seat installed and still open access to the third row (like the Nissan Pathfinder) – they do fold and slide, with a little extra step making it easier for smaller kids to clamber up there than some SUVs with high floors and no sideboards. And as Brendan pointed out in his First Drive of the Ascent, the doors are simply phenomenal, opening wide for easy access, with sunshades to help battle the sweltering heat, and the lower part covering the sills so that no one gets messy no matter how they climb in and how dirty the Ascent might get in our long winters or muddy adventures. Second-row captain’s chairs are available as a $500 option on Touring and Limited trims, and standard on Premier models, although with our kids in booster seats, any extra comfort from those seats would have been wasted. As it is, the bench seat of the eight-passenger model we drove is plenty comfortable, and the second row has acres of head- and legroom, plus the wide panoramic sunroof stretches over the second row, so it’s bright and airy as well, with the kids getting their own ventilation controls (that we repeatedly had to lock them out of because they kept playing with them). Rear passengers get the usual armrest cupholders and door pocket bottle holders and USB charging ports, but the Ascent does one better, with a cupholder high on the door that is easily reached by kids, even when the middle armrest is buried behind junk on such a road trip. The driver’s seat in our $46,495 Limited model was 10-way power adjustable (front passenger gets four-way power adjustments), with plenty of range to provide a good driving position for me or my much-shorter wife, with two memory positions making it much easier whenever we did a driver swap. The seats in front and back and the steering wheel were heated in this Limited trim, and the interior was covered in soft, rich leather, but it takes the final step up to the $49,995 Premier to get ventilated seats that would have been welcomed in weather that was consistently over 30 degrees Celsius. Those seats were comfortable, though, and after a few hours’ driving I felt fresh enough to start pitching our tent and dragging the picnic table back and forth until we were happy with our campsite layout. Aside from the comfortable seats, there were also plenty of small storage areas for our phones, an armrest cubby big enough for an iPad or my wife’s purse, and of course, more USB ports, a neat shelf over the glove compartment, and a shorter one for the driver left of the steering wheel, just big enough for a smartphone or pair of sunglasses. Without being too anticlimactic about it, the Subaru Ascent drives like a large crossover. It is largely devoid of any distinctive Subaru character, as the sheer size overwhelms the lower centre of gravity and balance bestowed by the boxer engine and symmetrical all-wheel drive. Sound deadening and a well-tuned CVT keep engine noise from infiltrating the cabin. In the case of the Ascent, the boxer engine is a 2.4L turbocharged four-cylinder making a stout 260 horsepower and 277 lb-ft of torque fed to a continuously variable transmission and then on to all four wheels. Although the Ascent is no featherweight, weighing in between 2,005 and 2,081 kilos depending on trim, the throttle is quick to respond, the CVT gets it right to the heart of the power band and torque comes on at an early 2,000 rpm, so it’s both quick but relaxed. However, at highway speeds it takes some time and noise to unlock its passing power, especially when loaded to the brim with the family and camping gear. Thanks to the mostly highway driving of our route, the Ascent returned some decent fuel consumption even after a weekend of typical suburban shuttling tacked on, showing 11.0 L/100 km after more than 1,000 km on the trip computer. Official NRCan estimates suggest it should get 11.6 L/100 km in the city and 9.0 on the highway. All trims except for the base Convenience get 2,270 kg (5,000 lb) towing capacity thanks to Subaru adding a transmission oil cooler, and all models come equipped with a manual mode and paddle shifters to keep the engine in its peak power band when you want to. Still, I’d be hesitant to recommend it as a tow vehicle for anything too heavy until that powertrain has some time on the market to see if the CVT can hold up to the added stress despite the added oil cooler. A roof rack is also standard, and no doubt there are already owners strapping canoes, kayaks, and bikes to it, but note that it is rated at an 80 kg max. At the other end, the Ascent manages a healthy 220 mm of ground clearance, so it can tackle some mildly rough terrain. Despite an “X-Mode” offering simulated low-range gearing as a function of the CVT and hill-descent control to make easy work of steep hills with low traction, it’s no off-roader, with all that breakable plastic cladding. Although Algonquin is a well-developed campground, we did hit a couple gravel roads with deep ruts and dips that the Ascent handled smoothly, so within its limitations, it should be a stellar performer. For our purposes, it was its highway manners that were tested most, as well as some of the winding country roads in the Muskoka region. On the highway it has a superb ride that cushions any expansion joints or construction zones, absorbing impacts and insulating noise. Pair that ride with adaptive cruise and lane-keep assist as part of Subaru’s EyeSight suite and it should have been an effortless drive, but both my wife and I found the steering too light and vague at highway speeds, so it tended to wander, and the lane-keep assist too late and too abrupt to intervene. That made for a bit of nuisance in an otherwise relaxing drive. In a car this big and loaded up as we had it, you don’t go looking for twisty roads, but I found myself on a couple anyway, and despite a fair bit of body roll and the vague, light steering, the Subaru Ascent felt composed and stable enough up to and beyond the speed limits. At low speeds, the light steering is a boon, with a decently tight turning radius making it easy to manoeuvre around crowded parking lots or trees in the middle of your campsite. Although the back-up camera has guide lines to help you place its wide back end, many competitors offer 360-degree cameras that take all the guesswork out of parking these large crossovers, a feature unavailable with the Ascent, although Premier models offer a forward-view camera in addition to the rear-facing one. However, blind-spot detection, lane-change assist, and rear cross-traffic alert are all present and accounted for in Touring models and above. For as long as I can remember, Subaru has been behind the curve when it comes to its infotainment systems, and as much as this system takes another step forward, I’d still trade it in for any number of competitive systems, such as those from Chrysler/Dodge, Hyundai/Kia, Honda’s latest, and even Ford’s most recent Sync. The display is bright and colourful, 8.0 inches diagonally in $40,995 Touring models and above (Convenience models start with 6.5 inches), but despite improvements in response time and sensitivity of the touchscreen system, it still has a tendency to lag in certain menus and functions, and seems slower than others. Plus the image quality and design feel at least a generation behind. Granted, this is in comparison with some very good systems, and it is a happy step forward and perfectly agreeable coming out of any other Subaru, and standard Apple CarPlay/Android Auto integration on even the base $35,995 Convenience model make the native system almost irrelevant. Our Limited trim also came equipped with a 14-speaker Harman Kardon audio system, so we didn’t have to force the kids to sing camp songs to entertain us all the way there, and could jump between our favourite playlists and satellite radio, plus you can even play your Aha radio app through the system. After fumbling around for a bit and having to park it to enter a destination properly (voice recognition just doesn’t know what to do with Algonquin Provincial Park), the navigation guided us to our campsite without error. In addition to the main infotainment screen, there is a dash-mounted screen that can scroll through various fuel consumption displays, all-wheel drive power distribution, boost gauge, and other extra info, and yet another screen in the gauge cluster provides redundant info about audio, phone, trip computer, and driving safety systems. You’ll never be short of info in the Ascent. To a certain degree, the Ascent is an incredibly boring vehicle. It’s another seven-seat crossover in a segment bursting with good options, and it blends right in with the competition looking like a Honda Pilot clone with Mazda CX-9 power and Toyota interior. Okay, of course there are differences, but those aren’t bad targets to aspire to and I’d consider that an unqualified success. Subaru learned its lesson that being too different and too true to its brand might not work when expanding into a new segment with different expectations and demands. 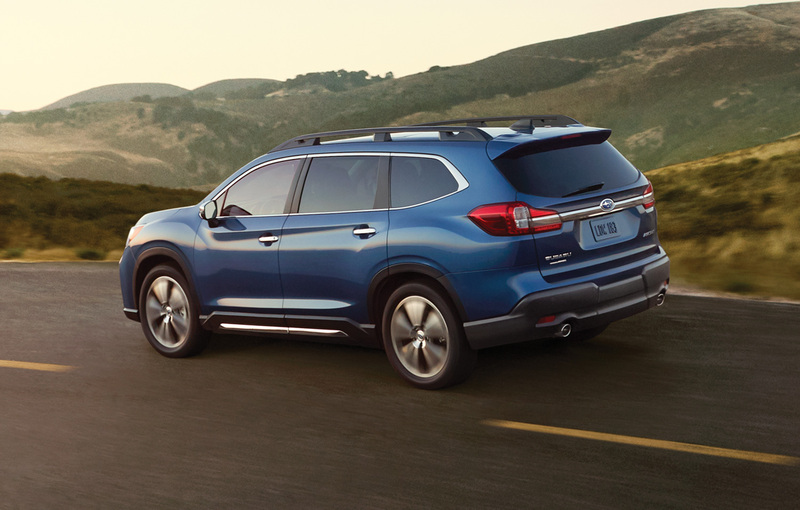 The 2019 Subaru Ascent provides Subaru loyalists with a need for more space and seats a way to step up when the time comes. But that’s not all it has going for it, as it has the kind of balanced qualities – features, technology, value, inoffensive styling, ease to live with – that those tempted across the aisle by Subaru’s safety and rugged image will have good reason to take the chance on the newest seven-seater on the market. The Ascent is spacious, efficient, comfortable, supremely practical, and won’t likely offend anyone with its bland looks. And that is exactly what Subaru needs in order to build on the success they’ve had with their entire SUV and crossover lineup.